A senior police officer who spent almost 30 years working in Northern Ireland is surprised at the level of sectarianism in Scottish football. 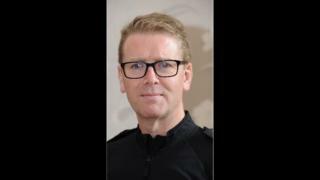 Deputy Chief Constable Will Kerr, who joined Police Scotland six months ago, described the problem as "almost visceral". Mr Kerr also warned that offensive behaviour at Scottish football matches had increased in the last year. Recent incidents include officers being attacked and spat on. The Scottish Police Authority board meeting heard a police horse also required treatment after it was hit with a flare. Mr Kerr made his comments after being asked by David Crichton, chairman of NHS Health Scotland, if there was evidence of an increase in sectarian abuse and offensive behaviour at football grounds. He told the SPA board: "We have been concerned about a rise in that behaviour over the last 12 months . "It is hard to quantify empirically. "It is as much a feeling from the officers who are subject to that aggression and who police those football matches." The problem, once dubbed "Scotland's shame", recently returned to the headlines after Kilmarnock manager Steve Clarke highlighted the verbal abuse he received from Rangers fans. Kilmarnock and ex-Rangers striker Kris Boyd also spoke out about chants he was subjected to by Celtic supporters. Others to have shared their negative experiences of life in the Old Firm spotlight include Chris Sutton and Neil McCann. Mr Kerr, who rose to the rank of assistant chief constable with the Police Service of Northern Ireland (PSNI), told the SPA he had quickly come to realise the importance of the sport in Scotland's social fabric. He said: "What I have been surprised at over the last six months, particularly when it comes to behaviour at football matches is two things. "One has been that level of sectarianism on display, and I say that having policed in Northern Ireland for nearly 30 years, and I have been surprised at how much it is seen as normal. "All the symptoms and how it manifests itself at football is seen as normal in Scotland and that has surprised me. "At times it feels almost visceral, in a way that I have not experienced in quite a while, and I say that with some surprise." The former National Crime Agency director also said he had been taken aback by the level of disorder on display at some football matches. He added: "We have been concerned, particularly over the last 12 months, that there has been a rise in both disorder, that type of offensive behaviour, and the levels of aggression towards police officers. "In the last two weeks alone that has been subject to quite a lot of commentary. "People can see it for themselves, the types of behaviour on display. "We have had officers pulled off horses, spat at, attacked, very aggressive behaviour towards them." The SPA meeting in Greenock also heard the violence had not been confined to officers. He added: "We had a police horse which had a pyrotechnic flare thrown at it a couple of weeks ago. "It was injured to the extend it had to go to the vet. "And, again, I've been surprised the consistently thuggish behaviour of a very small number of fans is considered normal. "This is not normal. It is a sport. "There is a responsibly and a need for everybody, including the police service, to collectively challenge ourselves about how much that is considered normal and what we can collectively do to address it." Last month three men were arrested following an incident involving police officers and horses at Celtic Park. Mr Kerr said all parties involved, from fans and clubs to governing bodies and local authorities, must collectively address the issue. He added: "Is there something we can do differently to move that sort of behaviour from being normal to being unacceptable? "Part of that will be through enforcement but only part of it. "We are certainly not going to arrest our way out of this issue." An independent review of policing at football matches in Scotland is due to be launched next week. In 2017 a report by academic Dr Duncan Morrow concluded a culture of denial about the extent of problems caused by sectarianism still existed in Scotland.